I jumped on the Hobonichi bandwagon at last. I’ve been looking at them for over a year and never took the plunge. However, I recently set up an A6 travelers notebook to be my new everyday carry to replace my pocket Finsbury and just didn’t like it. It wasn’t long before I was itching for something different. I then stumbled upon other people’s Hobonichi Weeks set ups in great little cases with lots of pockets. Seeing this as my excuse to finally get a Hobonichi, I ordered one. Instead of ordering from the official Hobonichi store I ordered from a great little shop on Etsy. It actually worked out cheaper and if what I heard from other people is correct, shipped out a lot quicker too! I received it after less than two weeks of ordering. This is the White Line edition in ivory, which means it’s a lovely soft cover. I’m not a massive fan of hardcover notebooks and planners so I’m glad this was available. It’s made of PU leather and so if you’re opposed to the smell of that you may not be a fan of this. You get a lot for such a little planner. In this little guy there’s 240 pages in total. Because the planners use high quality but super thin Tomoe River paper, this isn’t a bulky planner. It’s only 10mm thick! Alongside the yearly at a glance, you also get 13 months of month at a glance and 57 weekly spreads. Each weekly has a week to one page and a grid page on the right hand side. The weekly pages are really nicely designed. Each day has two little points that you can use to divide the days up into three if you wanted to. The grid on the right hand side also has slightly darker lines that match up with the lines on the left hand side if you just wanted more room to write for each day. After the weeklies there’s 74 spare grid pages that are numbered. This pleases the bullet journaler in me! These are perfect for jotting an ideas down on the go. The planner also comes with two strings which is very handy and means I don’t have to worry about finding my pages in a hurry. Despite being a Spring edition which means it should start in April, it actually starts in March so I’ve been able to get a few extra weeks of use in before my cover arrives. At the back, you get some extra pages, pretty much all in Japanese. There’s also a ‘top 100’ spread which is a neat little idea. The Japanese doesn’t bother me but if you prefer an English planner you would need to get the A6 Hobonichi which has a day to a page format. What else do you get with the planner? As well as a super handy (for someone that wants to go to Japan soon) Japan rail map, you also get an adhesive pocket for the inside of your planner. I love this. I love having some extra storage and this was a fantastic surprise. This is particularly helpful if you’re not planning on buying a case for the planner. As I’ve got a case on the way, this will probably keep a small sheet of stickers or something in. Other than travelling with me home for a few days this has largely stayed on my desk. I’ve still been using it though, to get used to it. I’m patiently awaiting a cover from Cadenta notebooks. When it arrives I will be moving my extra cards and vouchers that I used to have in my Finsbury into it. This will then become my on the go planner. Because I had heard about how great Tomoe River paper is for fountain pens I just had to pick one up for this. Knowing that it would be my every day carry I decided to try out the Platinum Preppy. I saw this frequently recommended as a great cheap fountain pen and so far I’m loving it with this planner. 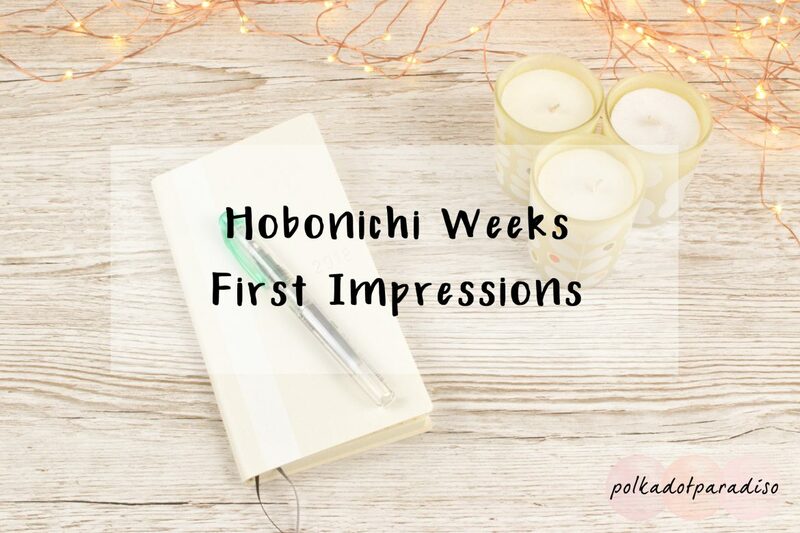 Have you got a Hobonichi? I’d love to hear your thoughts in the comments below!